That’s the message behind our recent analysis of price changes over the last 20 years. We looked at everything from mass market consumer items, like TVs, cell phones and apparel, to critical life-altering purchases, like healthcare, college tuition and textbooks. It turns out that the most important things in life keep getting more and more expensive, while the things that don’t really matter keep getting cheaper. Proper credit for inspiring our visualization belongs to Mark J. Perry at the American Enterprise Institute. His original visualization was so good that we couldn’t resist using the same basic idea for our purposes. The underlying data come from the U.S. Bureau of Labor Statistics, which keeps detailed records of consumer goods as well as average hourly earnings. Of course, these figures take into consideration inflation. We start by using prices in 1998 as a benchmark, plotting the relative percentage increase or decrease for each category over the last 20 years. The result is a snapshot of the American economy, providing several key insights about both the standard of living for most Americans and the unique challenges companies face to remain relevant. 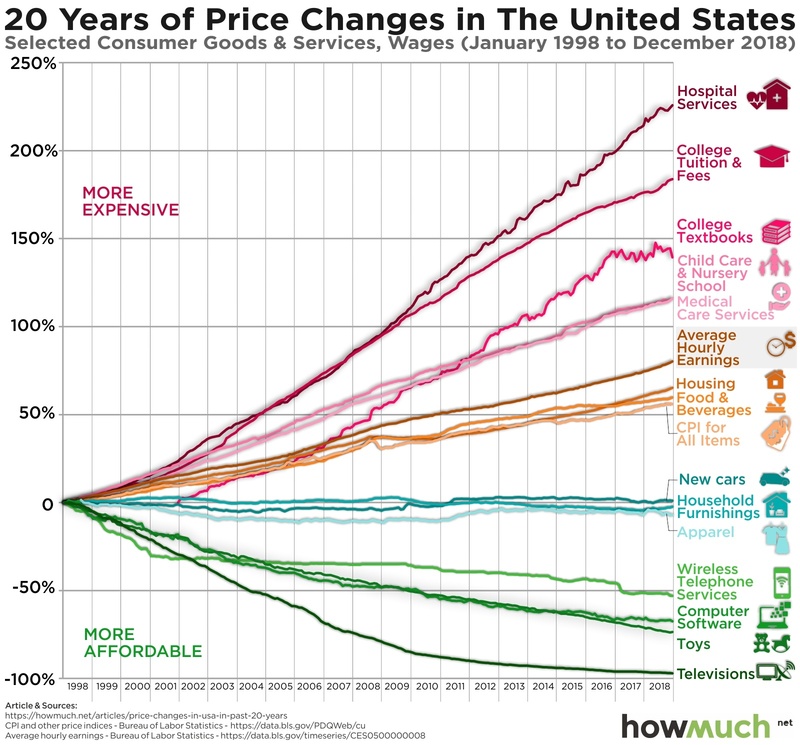 Let’s start with the things that have become more affordable in the last 20 years, consumer goods. It costs substantially less money to purchase a TV now than it ever has in the past, dropping some 97% since 1998. We see similar eye-popping declines for other mass consumer products like toys, computers and cellphones. It’s worth pointing out that all these things are not just cheaper, but they’re also objectively better. Almost all TVS are now high definition flat screens with Internet connections. Cell phones are like miniature computers in your pocket, and toys are designed for cognitive development. They’re cheaper and a lot better. There are several items that haven’t really changed that much in terms of price. Apparel, household furnishings and new cars all cost about as much as they did in 1998. Similar to TVs, cell phones and computers, cars have also gotten substantially better with the creation of new technologies. Adaptive cruise control automatically adjusts to the flow of traffic, and lane assist keeps the vehicle where it’s safe. Even backup cameras are relatively new in automotive history, and yet they come standard in most new cars. And then there are things that have exploded in relative price, especially compared to average hourly earnings. Healthcare is now over 225% more expensive, and getting a higher education is not far behind at 183%. Both categories have more than doubled the growth rate of average hourly earnings, making them less affordable for middle class families. College textbooks alone now run students almost 150% more than they used to. Why have these prices increased so much, whereas consumer goods have become cheaper and cheaper? It’s debatable to what extent healthcare and educational outcomes have improved over the last 20 years. And there are lots of possible reasons why they cost a lot more than they used to. Government regulations, market conditions, monopolies and professional certifications all play a role. There’s also a strong bias in both fields for reputation and pedigree. Will we ever get to a place where all the technology in the world could replace the judgement of a Harvard-educated doctor? Maybe, but in the meantime, consumers are paying top dollar for the things that determine major life outcomes while demanding lower prices for other products.